Just like in the DC Comics universe, certain characters in the Marvel Comics universe have shared the same superhero identity, sometimes at the same time. Take Captain America. Steve Rogers is chiefly known as the patriotic hero, but at other times, both Bucky Barnes, a.k.a. Winter Solider, and Sam Wilson, a.k.a. Falcon, have held the mantle. With many thinking that Avengers 4 will mark Chris Evans‘ last appearance as Steve in the Marvel Cinematic Universe, there’s been speculation that the Captain America identity will be passed to either Bucky or Sam. However, a recently-announced project indicates that may not actually happen, which wouldn’t be a terrible thing. In case you missed the news, it was reported last week that Marvel is developing a Falcon and Winter Soldier TV series for the Disney streaming service. Empire writer and co-executive producer Malcolm Spellman is attached to write this series, and like the previously-revealed series for Loki and Scarlet Witch, respectively, this would be a limited run of six to eight episodes. Just to be clear, the Falcon/Winter Soldier series doesn’t have an official green light yet, though one can imagine there are a lot of MCU fans who’d want to see it. These shows for the Disney streaming service are intended to highlight characters who wouldn’t lead this own movies, and evidently Falcon and Winter Soldier fall into that category. Nevertheless, this will provide an opportunity to give these two more screen time together, arguably more so than if they were solely popping up in other movies. When we last saw Falcon and Winter Soldier at the end of Avengers: Infinity War, they’d both been turned to dust by the Thanos snap, but Avengers 4 is expected to expected to undo the Mad Titan’s genocide. So it’s likely that Falcon and Winter Soldier’s series will take place after they’ve been returned to life. Falcon and Winter Soldier’s brief time together in Captain America: Civil War was a blast, as they griped back and forth, one disliking the other for how close he was with Steve Rogers (though in Falcon’s case, he was also distrustful towards Winter Soldier due to his past with HYDRA). This limited series should be a good way for them to become friendlier with one another, though hopefully there will still be instances of them playfully giving each other a hard time. Conversely, the chances of one of them becoming the new Captain America don’t look good. If Falcon and Winter Soldier were sticking around in the films side of the MCU, then it would make sense for one of them to take over as the Star-Spangled Avenger, even if it was a supporting role to another hero. But now they’re being prepped for their own TV series, and the original report makes it sound like Bucky and Sam will be sticking to their current superhero identities. Which is the right call, as frankly, including the Captain America element would be too distracting for a show. If you’re going to dedicate six-to-eight hours to highlighting Falcon and Winter Soldier equally, then it’s not worth delving into the Captain America of it all. This shouldn’t be a series revolving around these two arguing and fighting over about who gets to wield the vibranium shield. It should be about them learning how to work better with one another and learning that despite their differences, they’re good fits for one another. If you throw in one of them wearing the red, white and blue uniform, then the dynamic becomes unbalanced. One character could be inherently seen as more important than the other because they’re the new Cap. Besides, it’s not like we absolutely need a new Captain America going into Phase 4. The post-Avengers 4 MCU landscape is going to look very different than what we’ve grown used to over the last ten years, with heroes like Spider-Man, Black Panther and Captain Marvel becoming the new central protagonists of this franchise, roles that once belonged to Iron Man, Captain America and Thor, among others. Let’s also not forget that once the Disney/Fox deal goes through early next year, that means the X-Men and Fantastic Four properties will be able to be absorbed into the MCU. With all those new characters, plus folks that Marvel Studios still has at its disposal but hasn’t introduced yet (She-Hulk and Nova, for example), there are plenty of new players that can be brought in. Even if it might be cool to see, there’s no absolute need for someone to fill Captain America’s shoes once he’s gone. Just because something happens in the comics doesn’t mean that it has to happen in the movies too. The times when Bucky Barnes and Sam Wilson served as Captain America were interesting and provided a sense of legacy, but it will also be interesting to see these two embark on their own adventure in a Disney streaming service series. This is a chance for MCU fans who don’t follow along with the comics to get a better sense of why these two are so appealing since they finally get to be leads rather than supporting characters. And hey, just because it doesn’t look like Bucky and Sam will take over as Captain America doesn’t mean that someone else couldn’t inherit the identity someday. Frank Grillo, who plays Crossbones, speculated that the new Captain America could be a woman, and since Sharon Carter is still running around the MCU, maybe she’d be a worthy candidate. In any case, the MCU has more than enough on its plate for the future that having someone around as Captain America isn’t absolutely necessary. Of course, assuming this is indeed the plan, this has us wondering even more what Steve Rogers’ ultimate fate will be by the end of Avengers 4. Will he die? Will he retire from protecting the innocent? Will he somehow reunite with Peggy Carter in the past? Whatever the explanation ends up being, we’re approaching the end of an era. Stay tuned to CinemaBlend for all the biggest updates concerning the MCU, which will pick back up on the big screen when Captain Marvel is released on March 8, 2019. Feel free to also look through our Marvel movies guide to learn what else this superhero franchise has on the way and in development. 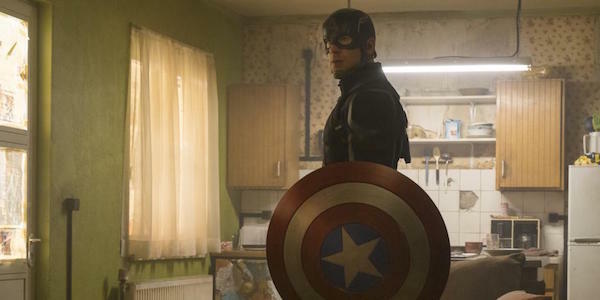 Are you OK with not getting a new Captain America in the MCU?